On February 9, 2016 filmmaker Usama Alshaibi’s newest documentary American Arab premieres on America Reframed. As a new promotion, Artvamp is now offering an educational edition of his previous film, Nice Bombs, along with public performance rights. See below for purchase information. In Nice Bombs, filmmaker Usama Alshaibi returns to Baghdad to reunite with his family after nearly 24 years. This documentary navigates through his unique relationship to an Iraq that is much different than the country of his childhood. Usama captures the conflicting reactions to the conditions of life in Baghdad. Through a wide range of opinions and experiences he provides a broad panorama of voices long neglected under Saddam’s regime. His cousin Tareef enters the room upon hearing an explosion. “It’s a bomb. A Nice Bomb,” he explains. The phrase is indicative of his family’s nonchalance about their situation. As one young boy put it, “We’re Iraqis. 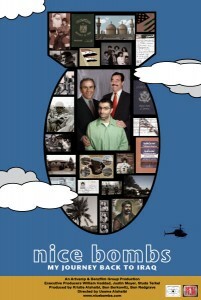 It’s normal.” With humor and resilience Nice Bombs explores Usama’s dual role as both Iraqi and American. When Studs Terkel urges you to do something, you do it. “He sort of put me on the spot,” recalls Usama Alshaibi, who was working at the Chicago History Museum as a sound engineer when his project sparked Terkel’s interest. It was January 2004 when the legendary author and historian came into Alshaibi’s office and asked about his family in Baghdad. Alshaibi replied, “Well, I have this idea about going to Iraq and interviewing my family….” And that’s what set Terkel off. “He said, ‘You have to go!’ ” Alshaibi says. “He pulled out his checkbook and gave me my first donation. Alshaibi does something so simple yet, sadly, so neglected: He lets a Western audience see Iraqis not as crazed Middle Easterners shouting and shooting (and dying) en masse, but as individuals going about their daily lives–shopping, listening to the radio, hanging out. Those shared-humanity moments make all the more compelling the postscript phone call, in which Tareef tells Alshaibi that, since his visit, Iraq has gone from tolerably bad to almost irredeemably worse. This educational edition of Nice Bombs comes with Public Performance Rights, exclusively available for purchase to schools, universities, libraries, and other educational institutions. A purchase grants the institution the right to screen the film to its students and faculty, on campus or school grounds, where no admission is charged, or to loan out the DVD to public library patrons. These rights are valid for the life of the DVD. For all other types of screenings, including public screenings, or if you have any questions, please contact us directly at store@artvamp.com. Digital License is also available. Please contact us for more information. A Classroom Rental is valid for a one-time screening in a classroom setting. We will send you the DVD approximately one week prior to the screening, and you will be responsible for returning the DVD to us following the screening. All orders are shipped from Boulder, Colorado. Please allow 2 weeks for processing and delivery of your order. If you are interested in having director Usama Alshaibi speak at your school, library or event, please contact him directly at usama.alshaibi@gmail.com.